You're a Good Man Charlie Brown not only exceeded expectations, but was practically perfect! You’re A Good Man, Charlie Brown is the musical based on the classic Schultz characters Snoopy, Charlie Brown, Schroeder and so on written by Clark Gesner and John Gordon. The musical surpassed expectations with its adorable soundtrack and will be remembered as a main example of an amazing for Showstoppers show generations to come. There was nothing that I could particularly single out as an issue with the entire show whatsoever. What I was particularly impressed with was the level of characterisations of each and every cast member; a particular standout for this was Daniel N’Guessan-Lopez with his stellar performance of Linus. His little quips and comedic gestures throughout the whole show had the audience in stitches. An example of this is when Linus tries to convince Snoopy (Samena Brunning) to catch a stick he has thrown: both characters did an amazing job at escalating the humour of the childish characters. Charlie Randall, who played Schroeder, similarly excelled at extrapolating the non-committal character in his own unique way. The quality of the singing was absolutely outstanding: each harmony was clean and in pitch, which is largely in part to the talent of Musical Director Joe Barr. Bella Norris, who played Sally, hit incredibly high notes with ease, supporting her voice so that it wasn’t strained in the slightest. Phoebe Armstrong (Lucy), however, did have some straining in her number “Schroeder”, but admittedly it was a technically difficult song with a lot of large octave jumps. Charlie Brown himself, played by the fresher Ollie Johnson was vocally impeccable. He will definitely be one for the society to watch! Charlotte Evans’ choreography was completely heart-warming and perfectly complimented the chirpy soundtrack. A particular highlight of mine was the ballet section featuring Sally and Snoopy that accented the classical section of “The Book Report” while they’re chasing rabbits. It wasn’t overcomplicated either so that the whole cast was able to perform it in sync and with conviction, as an ensemble. Particular praise should be given to Abbie Roach and Gabby Puleston-Vaudry for their exceptional production work. The set was like jumping into the Shultz world: in the best way possible it was like a child had drawn it, echoing to the nature of the characters and how they view their environment. Each cast member’s costume was monochrome with their own individual colour which gave them a distinct identification. Bella Norris’ costume was particularly joyous: it could not have been pinker (especially with the big pink spotlight following her)! There are few shows that make me smile from start to finish, giving me goose bumps with every harmony and making me laugh at every quirk and there are very few shows that I would label as perfect, but this is one of them. 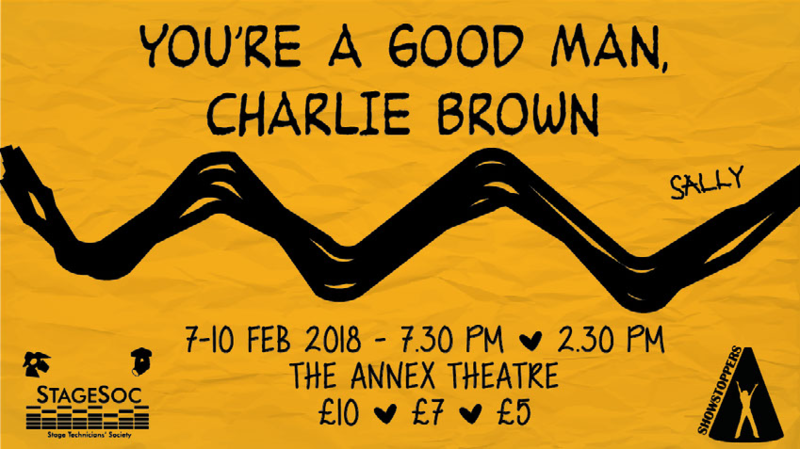 You’re a Good Man, Charlie Brown was at the Annex Theatre from the 7th to the 10th of February. Emma dabbles in perfoming arts ontop of a Chemistry degree, but after all, who does one of those anyway? She loves reading, shows and food. Especially food.